The front door of my house came without much in the way of an entryway, the small space was poorly used. Several separate improvements have combined to make it a cozy and useful way to transition from outside to inside. 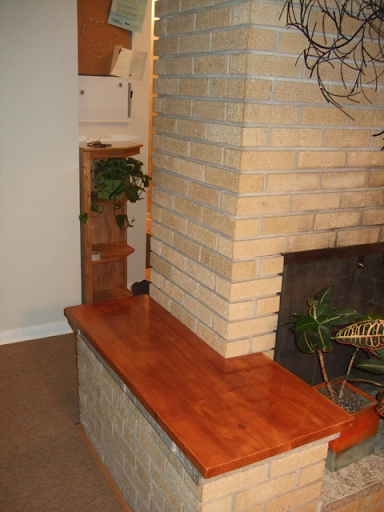 A masonry structure extending off the side of the living room fireplace was right inside the front door of the house, and yet instead of being a bench on which to repose and remove footwear, it was foolishly filled with an unattractive planter which, even if it housed nice plants, which it did not, would prevent the structure's use as a bench. I immediately threw away the planter and built a specially shaped benchtop for the structure. It was one of my very first house projects and it gave an instant boost to the entryway. In the wintertime, big boots track in lots of snow and soil. Since we had the floors refinished when we moved in, we fretted about floor damage. In the beginning I addressed the problem by taping down a pair of ugly woven rugs in the area, but more recently I bought a stack of rubber-backed carpet squares at Restore and installed them. I trimmed individual squares with a razor blade to fit the edges of my entryway and they happen to fit mostly very well. This house has adequate closet space, including two hall closets: one for vacuum, brooms, and other household gear; and a second larger one for coats, plus a double-sized cabinet above that for more items. Still, who wants to trudge into a house in the winter, wearing multiple layers of wet items, and carefully put them away in a closet? Not me! I installed a trio of quadruple-horned hooks on the back of the fireplace. I screwed them directly into the brick (I drilled the holes with a concrete drill bit). They provide a large capacity for holding winter coats, scarfs, and anything else than needs to hang out. In addition to the hooks, I placed some low slatted wood shelves to hold boots. Wet gloves and hats and other things such as purses can be set there, too. 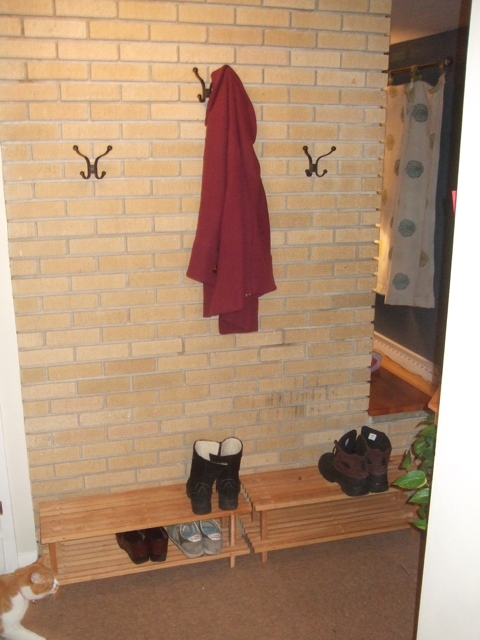 It is nice to come in out of the cold, plop down on the bench to remove boots, toss a wet scarf and coat on a waiting plentiful hook, leave boots on a convenient rack to dry, and move on into the house in any of three directions. 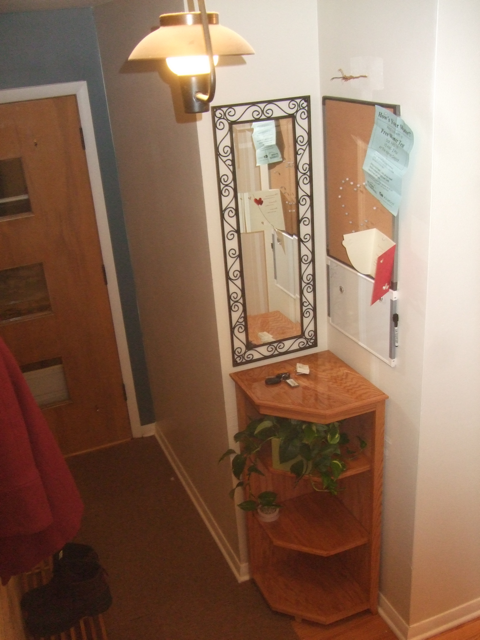 Previously there was a triangle/pentagon-shaped permanently installed double shelf in a little nook area adjoining the entry space to the hallway. This was originally designed as a phone shelf, and there was an accompanying wired phone hookup. Because I live in 2011, it's been over a decade since I've lived in a place with a land-line telephone, so I removed the phone jack. I also removed the shelf and replaced it recently with a corner shelf from Finish-It here in Madison, which I stained the same color as the entryway bench and also the living-room bookshelf. Above the new corner shelf I hung useful wall ornaments for a family: a mirror is convenient for checking one's appearance before going out into public, a cork board is convenient for posting papers about upcoming activities; a whiteboard is convenient for leaving messages and jotting down reminders; the whiteboard is also magnetic for posting additional papers.